Because of South Carolina’s prime coastal location, it’s almost mandatory that the Palmetto State dish out some amazing seafood. Really, there’s no excuse for lackluster seafood here when the coast is brimming with fresh-off-the-boat options. As the old saying goes, “There are plenty of fish in the sea.” And the Palmetto State is catching the best ones and putting them on your plate at these 10 best seafood restaurants in South Carolina. If you’ve ever formed preconceptions about what a themed seafood house should look and feel like, Drunken Jack’s is probably it. Patrons get the total dining experience with a ship-like ambiance and fresh seafood creations to match. You also get a nice view of the saltwater marsh while you dine. One of the Grand Strand’s best kept secrets, Brother Shuckers is a bit off the beaten path but well worth the drive. Open for lunch and dinner, you’ll find a great variety of fish, shrimp, calamari, oysters, tuna, mussels and crab dishes to sate your seafood cravings. They also feature plenty of tasty options for landlubbers. This four-location oyster eatery takes pride in presenting fresh seafood with a Lowcountry flair. Aside from their namesake offering, they’re serving up a variety of local seafood creations, like gumbo, cod sliders, lobster rolls, and seafood tacos. Having customers tout you as some of the best seafood in Murrells Inlet is no easy feat, since most of the restaurants here are well renowned for their seafood fare. 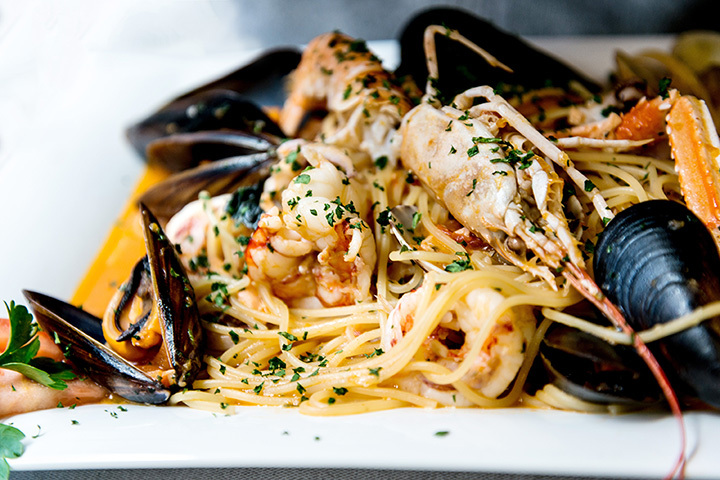 From fully cooked classics like shrimp scampi and lobster to raw bar offerings, the only thing that’s as good as the food here is their service. With two other locations in West Ashley and Coosaw Creek, you can expect fun, fresh seafood combinations. Locals dig it because of the good vibes and tasty variety of options, along with great service and cold drinks. Domestic shrimp, local oysters, and plenty of fried and grilled choices await you. You’d have to travel all the way to, well, Nantucket to get seafood like this. Open for dinner and Sunday brunch, Rick Erwin’s offers a high-end seafood experience that makes you think the coast was waiting right outside the door. You can expect to find tasty creations like yellowfin tuna, blackened swordfish, crab-stuffed lobster, trout, and scallops that no other restaurant in the area can come close to matching in freshness and quality. If seafood could also be considered comfort food, you’ll find it at Fleet Landing. This waterfront restaurant is known for its variety of locally caught fish and shrimp, along with classic fried favorites like shrimp, oysters, and flounder. For the more health conscious, they offer salmon, baked cod, and grilled fish tacos. Ask any regular Myrtle Beach tourist, and they’ll tell you no trip to the beach is complete without a visit to Sea Captain’s House. This quaint cottage overlooking the ocean transforms traditional seafood into southern cuisine with hospitality to match. It’s not on the ocean, but its location within a Lake Hartwell marina is the next best thing. Along with waterfront dining, guests marvel at the freshness of the seafood here despite being so far inland. The menu is small, and it isn’t strictly seafood, but the options you can find here are worth the drive. Can you say all-you-can-eat crab legs? This southern-style, no fuss diner serves up some of the best seafood that isn’t on the coast. Locals rave about the crab legs, but you can also find a good selection of scallops, oysters, crab cakes, fish, shrimp and hushpuppies.